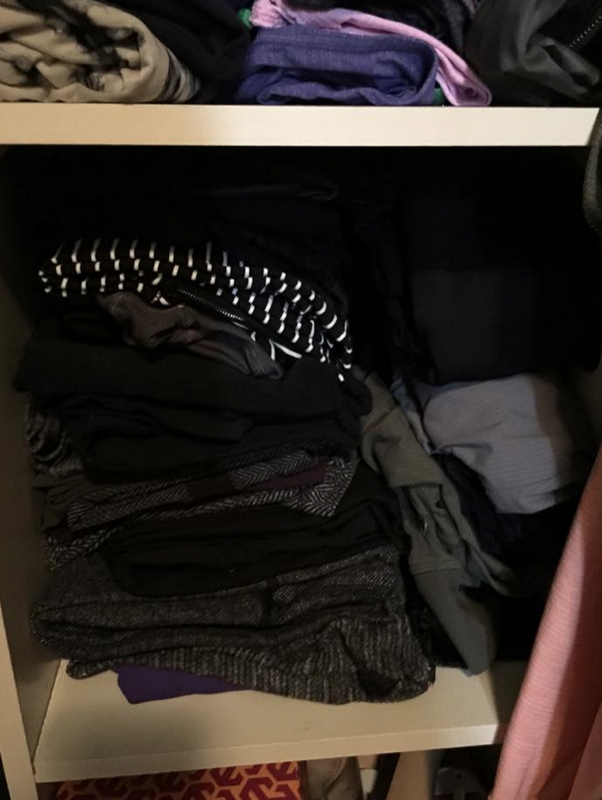 Last week I wrote a post about this book I read on the KonMari method of organizing and I said I’d share my progress with you. In the book, Marie Kondo says that you must purge all the items that do not bring you joy all at once, quickly and efficiently instead of taking your time going room by room. She also says that this process can take up to six months to complete and at the time I didn’t believe that because you are doing it ‘quickly and efficiently and all at once‘. One week in I now believe that it can take that long to get it just right. I’ve donated four bags of clothing so far and a giant rubber made bin of outgrown shoes. Luckily we have several charity donation bins near our house for clothing, shoes and books. On my way to drop my daughter off at school in the mornings we drive up to the bins and I unload all our good condition items. I still feel like I have a lot more pruning to do in my own closet, my oldest daughters closet and in our linens and shoes. It is definitely a noticeable difference already though and I’m finding putting away clothes a breeze now as is doing laundry. No more missing socks!! Below I have a few progress photos to share with you as well as some neat organization tricks for the fellow pack rat. These first two pictures I call my ‘first draft’ in editing my clothes and learning how best to organize them. 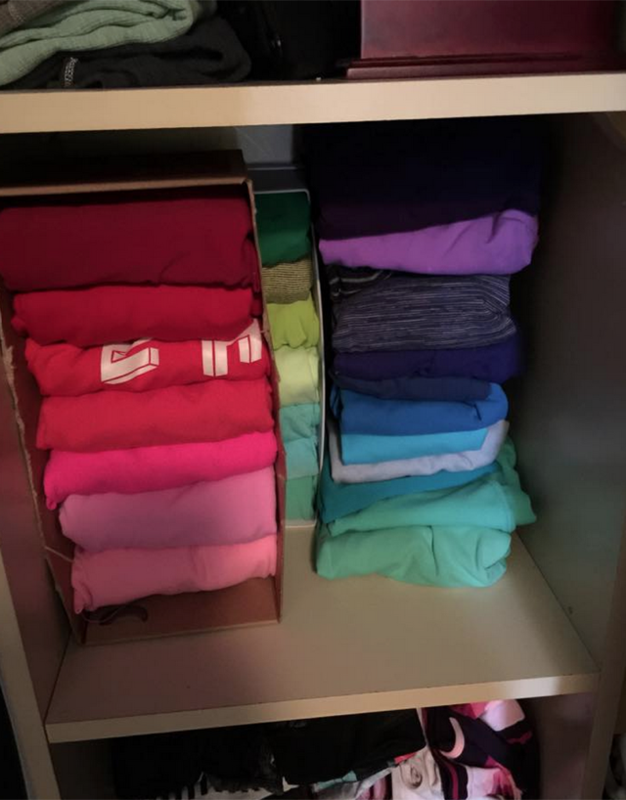 I have cubbies in my closet but my initial folding method didn’t look all that tidy and it is hard to take something out and put it back in it’s right place. I joined a MariKondo group on facebook called ‘KonMari Adventures’ to get some ideas on how to organize and they had the neatest ideas. All these boxes that I like to hoard for some strange reason now have a purpose. collect all your pretty boxes and shoe boxes and put them in your drawers or on shelves as organizers! 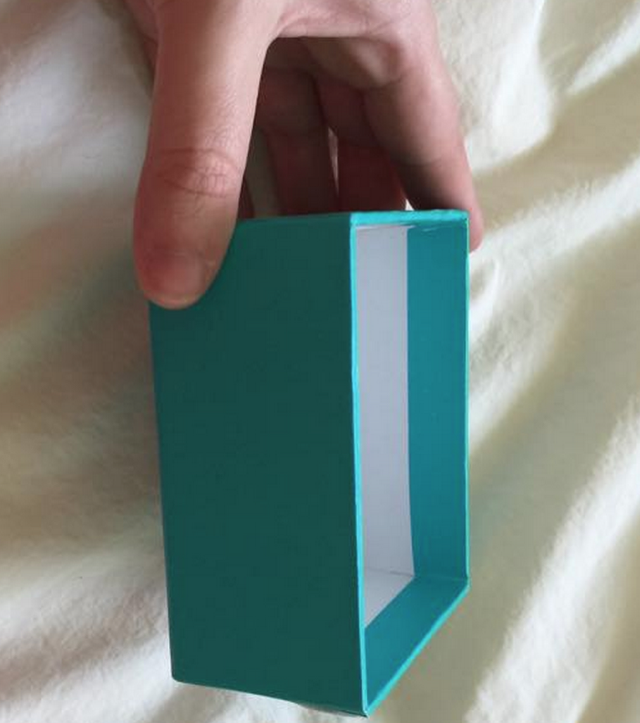 It drives my husband bananas but I’ve always liked to keep my pretty boxes such as starbucks mug boxes from this past Christmas, shoe boxes….tiffany blue boxes (ha!) Anything that is a really sturdy cardboard and pretty to look at I’ve kept. This blue box top from my Tieks shoes are perfect for underwear, headbands or hair clips and hair ties. 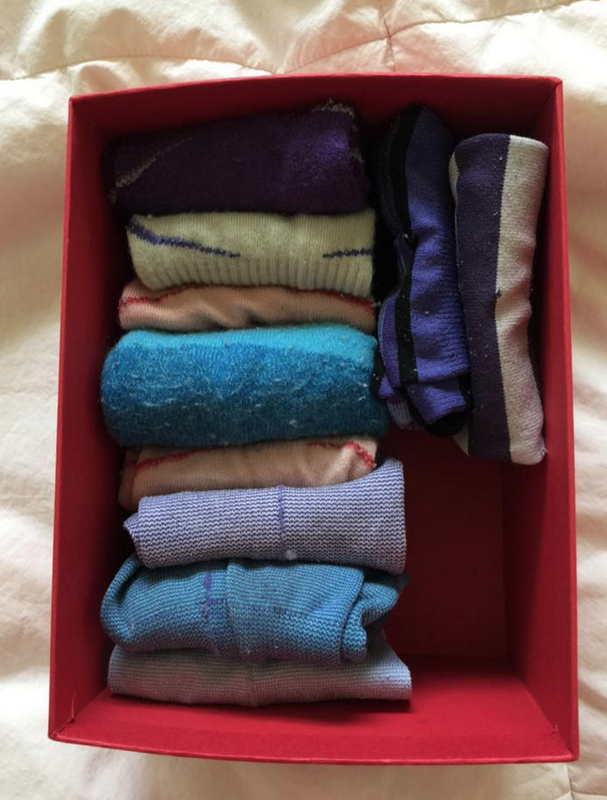 These are my pretty ‘resting’ socks nicely folded in my Starbucks mug box. I tossed a ton of socks that I never wear in my initial purge and I’m happy with the number I have now. 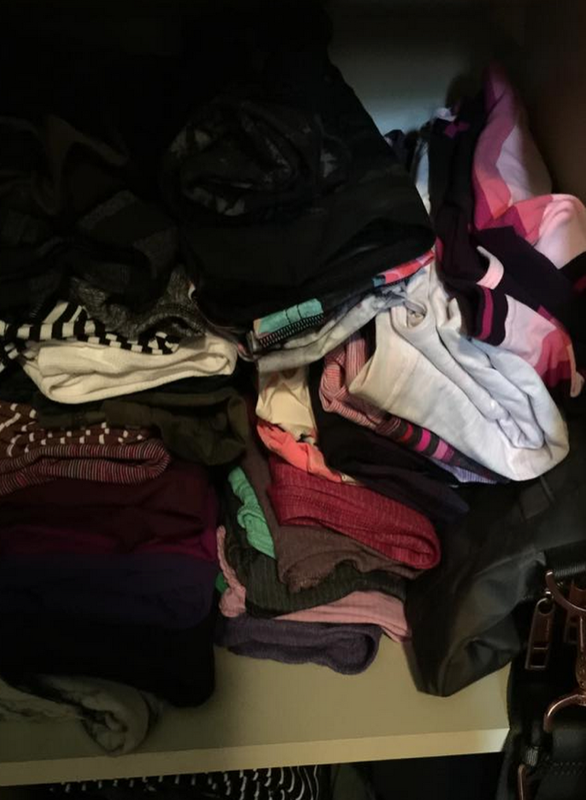 Plenty of workout socks and just enough boot socks. I repurposed my shoe boxes to organize my Cool Racerbacks. This way, I can easily pull out whichever one I want to wear and replace it without messing up my stacks. Here they are in my cubby. 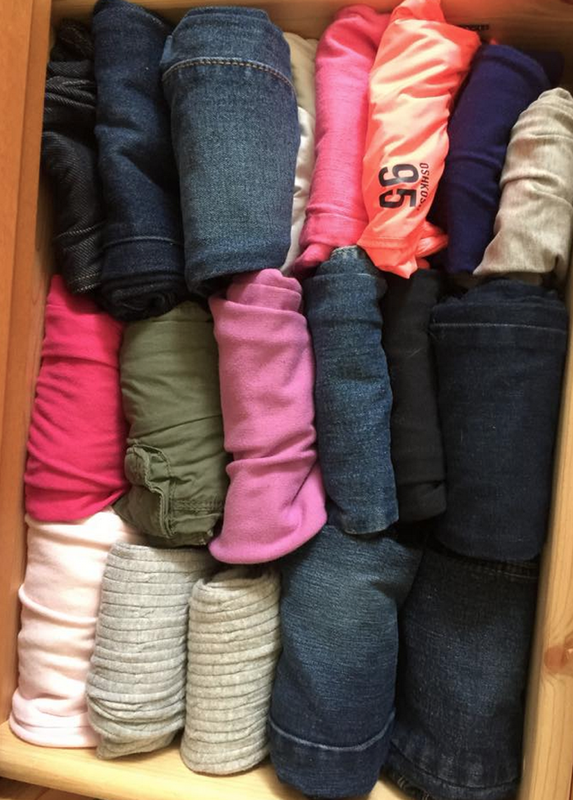 This is my daughters drawer but I think she has too many jeans that she hardly ever wears (thanks to Christmas gifts from relatives) so I’ll probably weed some out to pass on to cousins or donate. She tends to wear the same three pants on rotation so we can do better at this organization. I also think I can fold them narrower so they aren’t so bunchy. I’d love to make it so easy to reinsert folded pants that she can easily do it herself. We’ve been working on big kids chores and she really loves being independent and cooperative in helping to keep the house orderly so this is exciting for her. "Spacedye Gris On The Daily Hoodie, White Cyber Stripe High Times Pant, Seaspray Cool Racerback, White Street To Studio Pants and More"
LLM!! Thank you for a progress update post!! All of your pictures look awesome. I too keep all sorts of pretty boxes. What a great use for them. Love how your closets and drawers are looking. 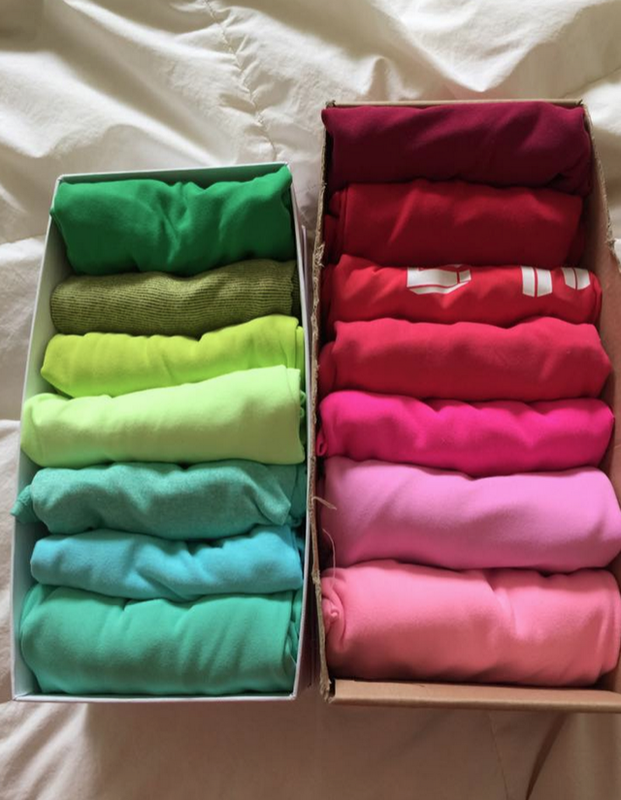 The box idea for socks and tanks is fantastic! I'm going to do this!